Litchfield Builders is happy to announce that we have won the 2015 Outstanding Residential Remodel Award at the Home Builders Industry Awards ceremony. Check out the Slide Share below and see the amazing elements of this remodel that helped us to win this award! Professional Remodeler magazine has just announced its 2013 list of "America's Top Remodelers" and amongst them, for the second consecutive year, is Connecticut's own Litchfield Builders. 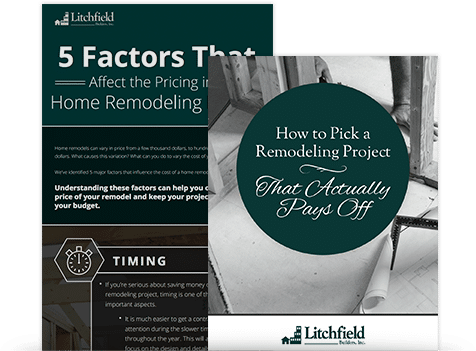 This annual list showcases the nation's largest and most profitable remodeling firms from all national markets and the Litchfield Builders team is excited to be included once again. Wallingford Kitchen remodeled by Litchfield Builders Appears in the Latest Issue of Arts & Crafts Homes Magazine. Hamden, CT -- If you haven't picked up the latest issue of Arts & Crafts Homes Magazine, you're in for a pleasant surprise. In the Winter 2014 issue of the national magazine, local award-winning construction company, Litchfield Builders, has their work prominently featured as the "Perfect Kitchen for a Pottery Collector".